This year, 2018, has been the year of the half marathon. 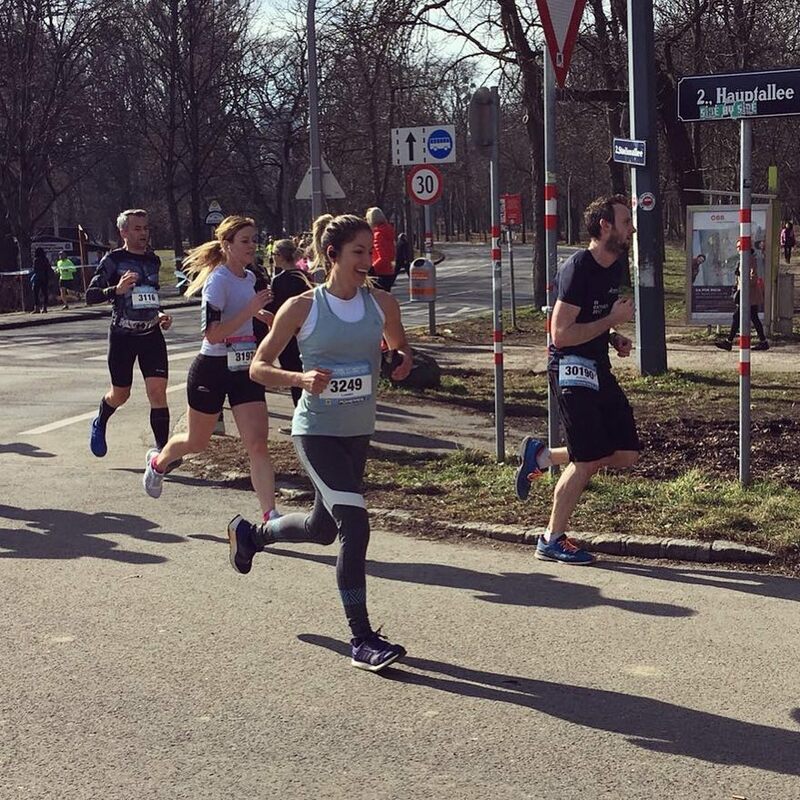 I decided last year to run the Vienna City Half Marathon on April 22, 2018 (Earth Day!) and my speed and endurance training plan has been going on since the year started. This will be my4th half marathon and at the end of EVERY single one, I always said, “I will NEVER do this again!” :p Funny how things work out. I want to share my half marathon training mistakes with you in hopes that I can help some of you avoid them. Not figuring out which shoes are the best: I was always switching from one brand to another and never found which shoe was the best for me.I have even accidentally forgot my running shoes on the way to my 2nd half marathon and ended up wearing an old pair I had in my trunk…BIG mistake. It wasn’t until I got my running style analyzed at adidas headquarters did I find an amazing shoe which I really enjoy running in – adidas ultra boost ST. This shoe is the best for me and I have been running in it for over a year. Not having a coach or a training plan: I never had any clue what a running training plan looked like. In fact, I had never used an actual training plan for a cardio goal until my sprint triathlon I completed last year. It’s so much better having a coach and a plan. I am learning so much. Just running how long and how far I “feel” like: While training for my last 3 half marathons, I had no method. I woke up and was like, “Okay today I want to do an 8K” or sometimes even, “I’m going to run as far as I want today.” This didn’t help me. Sometimes I feel more energized and I want to push myself a bit further or sometimes I am tired and I might need to push through it a bit more…having a running plan really helps this. I will never run a race without a plan again – no way, Jose! This pic was a few weeks ago at my 14K half-marathon practice race. I placed 1st in my age group & 6th overall women. Not practicing re-fueling during a long run: My first half-marathon I bought gels the night before at the expo and ate them during the race. I never even practiced that in my training. Someone told me, “Yes, you have to eat them every 45 minutes!” and I somehow thought it was a good idea to do that even though I never even practiced with it. OMG, and I think energy gels are absolutely disgusting – I almost threw up during the race. Now, I use 1-2 dates or these healthy cookies. Wearing new gear the day of the race: I already told you about my shoe incident in #1. Along with the gels pre-first-race, I also wore a hydration belt for the first time ever on race day of my first half marathon. It was so annoying, I ended up taking it off and running with it in my hand the last 4-5 km. I didn’t even know how to take the water bottle out the most efficient way. It was ridiculous – but hey, I made that mistake. Forgetting my bib # and chip 2x in a row: I didn’t realize the importance of being REALLY organized with all your gear the night before. In the USA, the long races start at like 5 or 6am. So I had to wake up around 4am to get there one time…sometimes earlier. My first 2 half marathons were not officially recorded because I forgot my bib and my chip BOTH times. Can you believe that? Coming back to a half marathon 6 weeks out after having been injured for 3 months: When I was 23 I fell in a grocery store and compressed my spine. I couldn’t walk for 2 months and I didn’t train at all for 3 months. I had signed up for a half marathon already and I thought that 6 weeks of running would be enough to conquer the distance. Worst mistake of my life, I was in so much pain for 2 weeks after the race. Wore shorts I had never worn to run before…and chafed big time! During my 2nd half marathon, we ended up having much warmer weather than what I expected. So I decided to wear shorts despite only running in 3/4 or full-length tights during my training. My shorts ended up riding up on my thighs and my thighs chafed so bad there was blood running down my legs. At the finish line, a friend of mine was waiting for me and she was like, “OMG, Lunden… did you start your period?” I looked down and there was blood all over my inner thighs. After rushing to the bathroom, I realized my thighs had chafed. I didn’t even think about that at all!